She received her BSc in Systems Engineering from Escuela Superior Politécnica de Chimborazo, Ecuador in 2009. 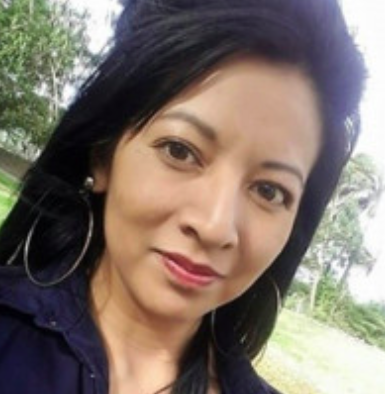 After her bachelor studies, she worked for Smartwork S.A. and Produbanco S.A. in Quito, Ecuador, where she was software developer and systems application manager, respectively, until she joined into University of Calabria as Ph.D student in 2013. She was a visiting researcher during 6 months in the University of Amsterdam, Netherlands in 2016. In 2017, Lorena received her Ph.D degree in Science and Technologies of Complex Systems from the University of Calabria, in the same year, she joined the School of Mathematical Science and Information Technology, University of Yachay Tech, Ecuador. Background Subtraction technique is widely used in surveillance systems to identify moving objects. Although color features have been extensively used in several background subtraction algorithms, demonstrating high efficiency and performances, in actual real-time applications the background subtraction performance is still a challenge due to high computational requirements. In this paper, two approaches and their optimized versions are evaluated to implement highperformance background subtraction algorithms for real-time applications. Gaussian Mixture Model and the Multimodal Background Subtraction are characterized by two different color descriptors: Gray scale and H color invariant combined with Gray scale information respectively. Different experimental analysis allows evaluating the efficiency in terms of computational complexity and accuracy for outdoor and indoor environments. Experimental tests demonstrated that the Multimodal Background Subtraction approach with its variants is established as affordable for real-time applications and particularly suitable on hardware platforms with onboard memory and limited computational resources. Effectiveness detection to extract objects of interest is a fundamental step in many computer vision systems. In real solutions, the accurate Background Subtraction (BS) is a challenge due to diverse and complex background types. Being the color widely used as descriptor to improve accuracy in several BS algorithms, in this paper we analyze four Color Invariants (CIs) based on the Kubelka-Munk theory combined with Gray scale. The capability of several CIs combinations in segmenting foreground is evaluated referring to five video sequences. This experimental study provides a point-of-view to choose the best color combination considering accuracy and the channel numbers which can be applied for image segmentation. The results demonstrate that the combination of the color invariant H with Gray scale achieves higher performance for foreground segmentation for both indoor and outdoor video sequences. Furthermore, it uses the minimum number of color channels. In many computer vision systems, background subtraction algorithms have a crucial importance to extract information about moving objects. Although color features have been extensively used in several background subtraction algorithms, demonstrating high efficiency and performances, in actual applications the background subtraction accuracy is still a challenge due to the dynamic, diverse and complex background types. In this paper, a novel method for the background subtraction is proposed to achieve low computational cost and high accuracy in real-time applications. The proposed approach computes the background model using a limited number of historical frames, thus resulting suitable for a real-time embedded implementation. To compute the background model as proposed here, pixels grayscale information and color invariant H are jointly exploited. Differently from state-of-the-art competitors, the background model is updated by analyzing the percentage changes of current pixels with respect to corresponding pixels within the modeled background and historical frames. The comparison with several traditional and real-time state-of-the-art background subtraction algorithms demonstrates that the proposed approach is able to manage several challenges, such as the presence of dynamic background and the absence of frames free from foreground objects, without undermining the accuracy achieved. Different hardware designs have been implemented, for several images resolutions, within an Avnet ZedBoard containing an xc7z020 Zynq FPGA device. Post-place and route characterization results demonstrate that the proposed approach is suitable for the integration in low-cost high-definition embedded video systems and smart cameras. In fact, the presented system uses 32 MB of external memory, 6 internal Block RAM, less than 16,000 Slices FFs, a little more than 20,000 Slices LUTs and it processes Full HD RGB video sequences with a frame rate of about 74 fps. One of the most challenging problems in computer vision is the ability of understanding video sequences to automatically detect and recognize moving objects. This work presents the development and the inexpensive implementation of an efficient algorithm based on the background subtraction technique adequate for low-cost embedded video surveillance systems. The proposed algorithm exploits the combination of few historical frames with the use of two channels based on the invariant color H and the grayscale level information to achieve high performance and good quality also within the Raspberry-Pi platform. Experimental results show that the implemented algorithm is robust against noises typically occurring in both indoor and outdoor environments. This paper presents a new method for background subtraction which takes advantages of using the color invariants combined with gray color. The proposed method works robustly reducing misclassified foreground objects. Gaussian mixtures are exploited for each pixel through two channels: the color invariants, which are derived from a physical model, and the gray colors obtained as a descriptor of the image. The background models update is performed using a random process selected considering that in many practical situations it is not necessary to update each background pixel model for each new frame. The novel algorithm has been compared to three state-of-the-art methods. Experimental results demonstrate the proposed method achieves a higher robustness, is less sensitive to noise and increases the number of pixel correctly classified as foreground for both indoor and outdoor video sequences.